Congratulations to the CLASS of 2012 - The CBC Radio 3 Bucky Award winners. Hottest Pipes (Best Vocal Performance) - Hannah Georgas "Robotic"
We first saw Georgas more than two years ago. That she's back on the Bucky radar with her second (self-titled) album is proof there's no such thing as a sophomore curse. Most Watchable Song (Best Video) - Said The Whale "We Are 1980"
They might be 1980, but 2012 was a whale of a year for the Bucky awards. STW played both sides of the border in April, touring in support of their second full-length album, Little Mountain. We were pulling hard for Loon Choir, who are rookier than The Elwins (formed in 2007). But we remember liking The Elwins' set at NXNE 2011. Mother Mother was the very first Canadian indie band one of us saw live (at St. Andrews Hall in Detroit, touring with Sam Roberts). They opened with "Hayloft." Quite the intro. We're so glad we had the opportunity to see them perform in 2011. Thanks for the music, Alexei and Dan, and all the best. Electronic Song of the Year - Grimes "Oblivion"
Shoot, pout pout pout pout, we were pulling for Shout Out Out Out Out. Best Reason to Learn French (Best Francophone Song) - Bernard Adamus' "Entre ici pis chez vous"
Hey! Someone we voted for actually won! We love this guy. Well-deserved recognition for the original doot doola doot doo dynamo. Golden Bucky (Song of the Year) - Joel Plaskett "Lightning Bolt"
Although "Bolt" isn't our favourite Plaskett song, his performances at this year's Home County Music & Art Festival made us fans, through & through & through. We can't think of anyone we'd rather pass our tiaras to than CMac. Welcome to the FOTY ranks! Love ya. "I know how you feel about all this Christmas business, getting depressed and all that. It happens to me every year. I never get what I really want. I always get a lot of stupid toys or a bicycle or clothes or something like that." If you're feeling like Lucy Van Pelt, we're not here to open up a psychiatry booth. But we might be able to help in the gift suggestion department. Because A Charlie Brown Christmas wouldn't be the same without the music of Vince Guaraldi, here are some of our favourite ideas for Canadian indie-themed musical gifts and more. After all, when all else fails, give what you really want and if it loves you, it will come back. Or something like that. 3. CBC Radio 3 merch. Also your chance to drop heavy hints that you'd love some R3 merch for yourself. And if your recipients aren't into Radio 3 quite as much as you, they might like some CBC Retro. 4. Good for one live show. Remember how much your mom loved those coupons you made for her when you were a kid? You know, "Good for one vacuuming." Make a grown-up version: "Good for one live show." We're not talking about $200 tickets to a megarena in the nosebleed section. We're talking about taking your SO or friend to your local small venue that supports Canadian indie artists. It will be remembered way longer than those fuzzy socks or box of Ferrero Rocher. 5. A Diamond is forever (or at least 12 months). Canadian indie bands catl. and The Pack a.d. have both recorded at legendary producer Jim Diamond's Ghetto Recorders. 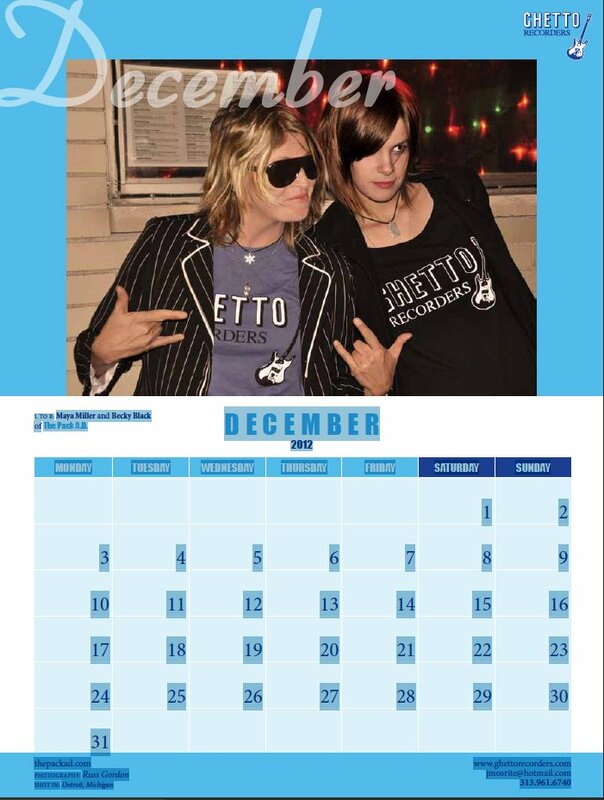 You can see more female talent from around the globe in the Girls of Ghetto Records 2013 calenders. $20 in the US and $30 outside of the US. Paypal to jmosrite@hotmail.com or send a check or money order to Ghetto Recorders, P. O. Box 2533, Detroit, MI 48202 USA. N2D photographer Russ Gordon's photo of The Pack a.d. is Ghetto Recorders' calendar image for December 2012. It's Bucky Day once again and CBC Radio 3's 7th annual award show has a new look. The day begins at 10:00 am ET/7:00 am PT with the first award - Sexiest Artist Of The Year - and culminates with The Golden Bucky Award for Song Of The Year at 5:30 pm ET/2:30 pm PT. A podcast version of the Buckys gala will be released immediately following. Tune in at http://music.cbc.ca/radio3/ or Sirius 152.